The Ladyjacks come together following one of many second half unsportsmanlike penalties against Henry Ford. ALPENA, MI — The Alpena Community College (ACC) women’s basketball team had yet to win a home game before Saturday’s contest against Henry Ford. The men’s team earned their first home win of the season Thursday versus Wayne County. In a tense game that featured one technical and five personal fouls, the Ladyjacks earned a 77-65 victory over the Hawks. Each of the major fouls were called against Henry Ford in an ugly display of sportsmanship and coaching. The men couldn’t find the same success as the women did against Henry Ford. The Lumberjacks were down 11-0 within a matter of moments and struggled making even their basic shots. 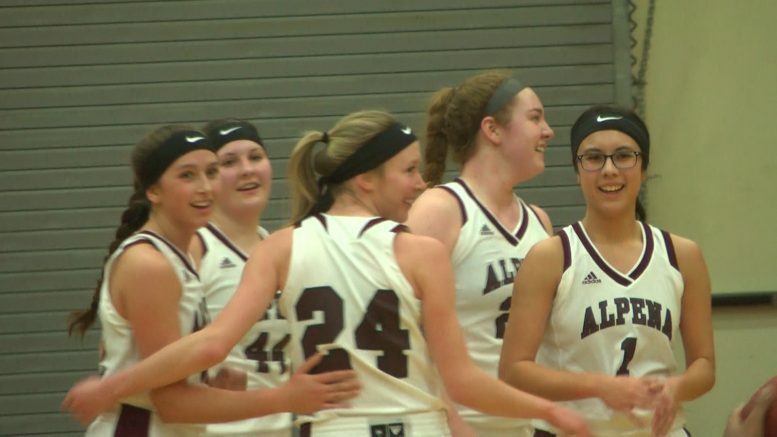 After losing 89-41 to the Hawks earlier this season, Alpena fell 82-52 this time around. ACC travels to Saint Clair CC on Wednesday before returning home on the 11th to face off against Henry Ford.